A breakdown of the component parts of a typical I ♥ E-Poetry entry. Image links to I ♥ E-Poetry @ ELMCIP KB. 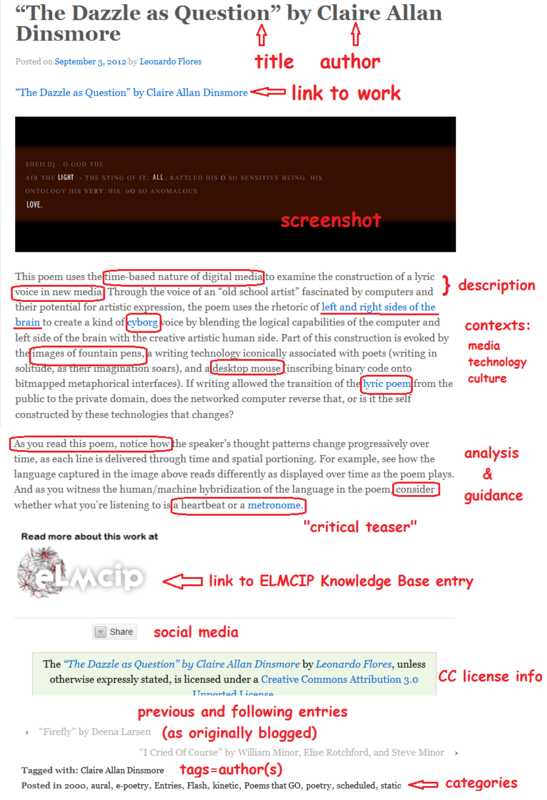 I ♥ E-Poetry and the ELMCIP Knowledge Base are now synchronized. The ELMCIP Knowledge Base (KB) is a database that connects writers, creative works, critical writing, publications, and events. It is developed by Scott Rettberg and the Electronic Literature Research Group at the University of Bergen, in Norway, and expanded by an international community of scholars. While Scott and I created the frameworks for integration, the most important contribution is actually entering the data, in both resources. Several members from the Electronic Literature Research Group have helped in this, among them Patricia Tomaszek, Eric Dean Rasmussen, Jill Walker Rettberg, Davin Heckman, and others, but none more than Hannelen Leirvag. Hannelen is a senior in the Digital Culture program at UiB and was my student in the Electronic Literature course in the Fall 2012 semester. Given administrator access to both resources, she put in long hours creating records, adding information to tags in both resources, linked KB records with I ♥ E-Poetry entries and viceversa, and helped debug both systems for optimal functionality. Her dedication and hard work have benefitted both projects immensely, for which I am extremely grateful. What can we do with this integration? For starters, it allows me (and others) to extract data from the KB to create data visualizations, such as the ones below. Click on the images to visit the data visualizations. 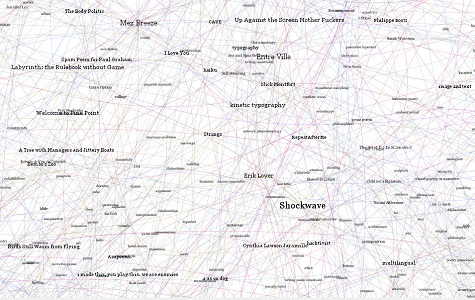 These published tools allow readers to see I ♥ E-Poetry through the ELMCIP KB’s eyes (so to speak), offering search tools, and a visual mapping that encourages exploration of different connections and affinities between authors, works, years, and tags (nodes). 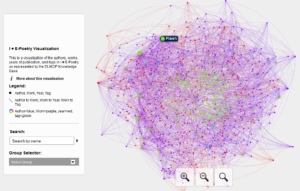 A little time spent searching, clicking through links, and mapping out the complex web of relations between nodes should lead to insight and discovery. And this is only the beginning. 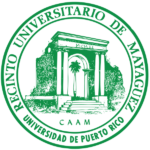 I have received institutional support for the Fall 2013 semester in the shape of a research release time to continue developing I ♥ E-Poetry, and through an internship course, where I will have 2 students working with me to continue developing both resources. Their first mission, to update all the links to I ♥ E-Poetry entries in the ELMCIP Knowledge Base, changing them from leonardoflores.net addresses to ones in iloveepoetry.com. In the meantime, enjoy the resources and visualizations, and stay posted for future developments and partnerships! And my heartfelt thanks to the ELMCIP KB team for their generous support! Reviewed on May 7, 2013 in Proxecto Le.es: Literatura Electrónica en España. Review is in Gallego. The transition from Tumblr to WordPress is a transformation from a performance writing blog to a knowledge base and electronic publication– something that will be discussed in the near future. A pull-down menu on the sidebar, which lists all categories with nested subcategories and the number of works under each category. That is a useful bit of information to be had at a glance, leading to exploration of other similar works. A menu in the header which presents the categories side-by-side, revealing a selection of subcategories under each with a mouse-over. So come explore this knowledge base of over 500 entries as never before! Have you ever wanted to write an I ♥ E-Poetry entry? Well this is your chance. 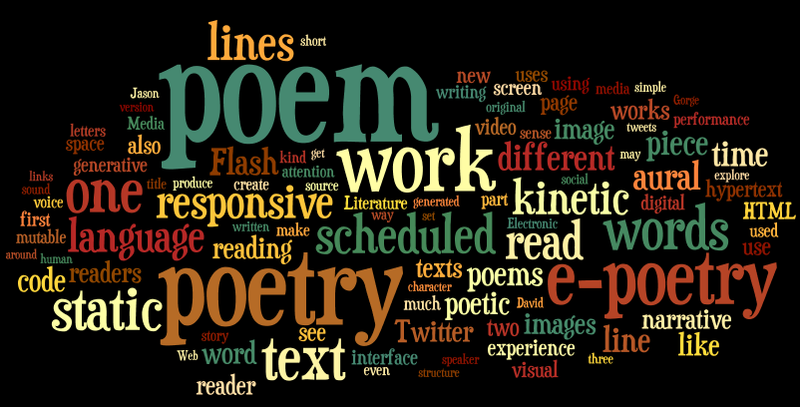 I ♥ E-Poetry invites guest contributions from its readers and the e-lit community. Read the Submission Guidelines and use the form below to send me a brief description of what you’d like to write about. I’ll set you up with a contributor account and you can get started right away! Everything begins with a single accepted entry. And why stop there? Multiple contributions are encouraged, even multi-part series. You may even become regular contributor. This Twitter bot has has been designed to automatically post an I ♥ E-Poetry entry once an hour. If you’re interested in exploring other works reviewed or reliving the excitement (!!!) of each entry, then this is the account to follow. It should take this bot about 21 days to tweet the whole project— which is just right for my current needs. After 500 consecutive days of reading and writing about e-poetry, I’m taking a much-needed break. But no worries, this is far from over. This is simply a pause before embarking upon the next stage of this project. In the meantime, I’ll be conducting some assessment, redesigning some aspects of the blog, migrating it to a new site, integrating it with the ELMCIP Knowledge Base, inviting guest entries, and more. This word-frequency visualization is generated from the 100 most commonly used words in the first 500 consecutive daily entries of this scholarly blogging project. Launched on December 19, 2011, I have been writing this blog every day, without fail, until today. That means I have written over 141,000 words— the equivalent of 564 pages of pure text (at 250 words per page), more if you count all the images. Since its launch, I’ve had the honor to welcome 9,788 unique visitors from around the world in 15,875 visits, with 31,434 pageviews according to Google Analytics data. I ♥ E-Poetry has received about 61.66% new visitors since its launch, which means the project has enjoyed a steadily growing readership and new audience. My Editorial Board— Alan Bigelow, Kathi Inman Berens, and Mark C. Marino— for your support and guidance on this project. The ELMCIP team, particularly Scott Rettberg, Jill Walker Rettberg, Patricia Tomaszek, and Hannelen Leirvag. The Fulbright Foundation and the U.S. Norway Fulbright Foundation, for the invaluable opportunity to spend a year in Norway teaching and researching 100% in my specialization. All the writers and readers who have reached out to me and offered words of encouragement. You’ve kept me motivated during dark days of lonely labor. My lovely wife Kara Fore Flores. Without your patience and support I wouldn’t be able to find the time to pull off such an ambitious writing challenge. Here’s to the next 500 entries! Kathi Inman Berens teaches at the University of Southern California’s Annenberg School of Communication and is a Fellow at the Annenberg Innovation Lab, where she works on virtual classroom software and embodiment. She curates and researches electronic literature. She teaches and researches transmedia branding, communication interfaces and hybrid pedagogy. You can visit her blog at http://kathiiberens.com/. Alan Bigelow writes digital stories and poems for the web. His work, installations, and conversations concerning electronic literature have appeared in many prestigious international galleries, media shows, journals, and collections. In addition to teaching full-time at Medaille College, he has been a visiting online lecturer in Creative Writing and New Media at De Montfort University, UK. You can see Alan Bigelow’s work at http://www.webyarns.com. Mark C. Marino is a critic and author of electronic literature, currently serving as the Director of Communication for the Electronic Literature Organization (http://eliterature.org). His work on Critical Code Studies has promoted the development of methodologies for interpreting computer source code. He is the director of the Humanities and Critical Code Studies (HaCCS Lab) at USC (http://haccslab.com). His portfolio can be found here: http://markcmarino.com. I am grateful for the support and guidance they have offered in the past and look forward to continuing our conversation. Stay posted for future calls for feedback on this scholarly blogging project. I am happy to announce that this blog has been nominated for a 2012 DH Award in the “Best DH blog, article, or short publication” category. This is already a great honor: in addition to being nominated by my peers, the nominations were vetted and selected by a committee for inclusion in the ballot. Now it is up to you to support the blog’s nomination with your vote— just click on the title of the posting above to go to the voting page. You’ll have to enter your name and e-mail, which will only be used to ensure authenticity and avoid multiple votes from a single person. The ballots will remain open until February 17, 2013. This scholarly blog was launched on December 19, 2011 as a constraint to read and critically reflect upon a work of e-poetry every day, leading me to revisit known works, discover new ones, and expand my knowledge of this emergent poetic genre. It is also designed as quick reference for those unfamiliar with e-poetry, with concise entries that provide poetic, technological, and theoretical contexts, close readings of the poems, and some strategies for readers to approach the work. This last aspect is an important part of my current work as an academic: to broaden the audience base for e-literature, both within and outside of academia. In order to extend its potential audiences, the blog uses a social blogging platform, Tumblr, and it broadcasts its content on two social networks: Facebook and Twitter. I ♥ E-Poetry is developing a worldwide audience, receiving over 19,000 page views and more than 5,600 unique visitors since its launch, according to Google Analytics data collected on February 4, 2012. It has been adopted in courses, used in comprehensive exam lists, reviewed in scholarly websites, and is currently being integrated with the ELMCIP Knowledge Base—a multinational research project funded by the Humanities in the European Research Area (HERA). It is worth noting that I have not missed a single day of postings since launching the blog, which brings the total number to over 400 entries. Interested in exploring this ever growing database? Visit the Resources Reviewed page for a list of publications & writers covered, browse the archive for a chronological overview, do a site search, use its tagging system, get a random entry, or read it as new material is posted. I’ve created over 25 websites, blogs, groups, and other online spaces since 1999. For the past 5 years, I’ve maintained a blog which documents my professional work, including most of my course blogs. I use Facebook to keep in touch with friends and family, sharing choice morsels of my personal life. Aside from my dissertation, articles, and presentations, I’ve been searching for my voice as a scholar of digital literature. I use Twitter to connect with my peers in the digital humanities and e-literature communities. I read, favorite, retweet, share, and occasionally reply, but I don’t feel like I’m making a contribution. My dad used to say one shouldn’t speak unless one had something to contribute to the conversation. So I’ve been mostly quiet: reading, listening, learning. Today it struck me: I know what to contribute. I’m going to read an e-poem every day, and I will respond to it in writing: in about 100 words. Every day. I’ll start with the Electronic Literature Collections, then take on the Electronic Poetry Center, or the Electronic Literature Directory, or the ELMCIP Knowledge Base, or poetry e-zines, or individual websites. The point is: there is enough e-poetry out there for me to read and respond to for a long while. If this blog helps people discover the poetic potential of digital media or sparks some ideas, great. If you’re interested, feel free to follow, subscribe, like, share, retweet, bookmark, whatever. Or not: it’s all good. It will serve me as an annotated bibliography of what I find interesting in e-poetry. And that alone will make it worth my time and effort. I’m looking forward to the challenge. Why E-Books and Kindles don’t innovate writing.